Welcome back to My Favorite Things! Are you ready for Giveaway #2? Sola Gratia Mom has been a powerful presence in the unofficial Classical Conversations mama blogging world. It seems like everyone has heard of her teaching plans and been wowed by her Wonderful Wednesday activities. 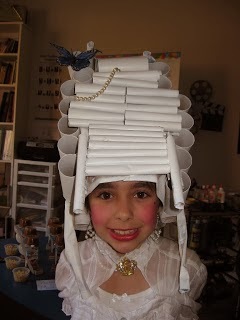 I mean, c'mon, did you see her Marie Antoinette wig project!? Brilliant! How cute is her girl?! Precious! 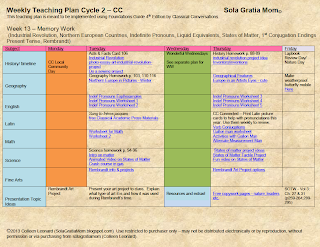 Colleen, the Sola Gratia Mom, has generously offered one copy of her awesome teaching plans for weeks 13-24 to one blessed reader. 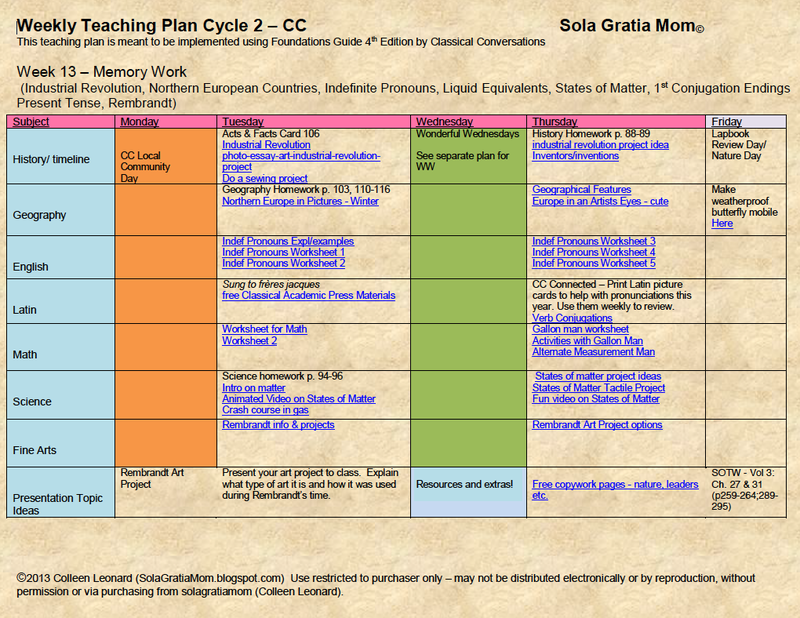 The teaching plans include the Wonderful Wednesday activities and pin map documents!
. . . I hope that the Teaching Plans will be an enrichment to an already exceptional program. I also hope it will help families not feel the pressure to run curriculums alongside of an already exceptional and full curriculum if they are left feeling like they could be doing more. It's a freeing concept once you get a hold of what Leigh has provided for us and "trust the model" so to speak. I also know that there are many hands on learners at the younger ages and Mommas that are crafty and enjoy doing hands on learning with their kids too, but don't have the time it takes to research it all - so this provides that option to them. I wanted to inspire families to take what Leigh already has provided and do what they love and their kids enjoy, to inspire you both as you move through the Foundations years and make memories in the process. The Teaching Plan is not something you have to follow day by day or week by week. Take from it what helps you and forget the rest. If you do 20 things from it this whole year then that's great and it's worth it! If you do all of it for this year - then you're exceptional and you should be writing these plans! :) I personally, do probably 65 percent of what I put on the plans in a given year. My daughter likes the games and videos because face it, we live in a technology rich world and she feels more a part of it when she's allowed to do something like a computer game on geography or watch a youtube video on math. I've already reviewed them and I know they're safe so it's a win win for us. We also do many of the english worksheets and all the Wonderful Wednesday projects along with select ideas for crafts/projects and experiments throughout the weeks of the year on our own. My first priority is always memorization and it's always an enrichment to the week, to delve into the memory work in a fun hands on way - not a requirement for the week. Ready to win a copy of her plans for weeks 13-24? Of course, right?! Enter below, and the winner will be announced this Thursday. If you're the winner, I'll contact you and you'll have 24 hours to respond. I know that's not a lot of time, but these giveaways are rapid-fire, and we have to get ready for the next one! Ready? Go for it! Yes, we love extra activities! And I just found out that I'm going to be a first time tutor (Abecedarian) for the second half of the year, so these would be an amazing help! Yes, hands on activities help my children (and me) to learn the material. ooooh, i love this give away. would love to have more ideas to make hands-on learning a reality. they love it! thank you! I'd love some extra help with creativity. We don't have too many hands on activities for memory work...I'd love some help in that area! We love doing hands on things. This sounds like an amazing resource! I always feel bad when we don't have a hands-on activity since I know it's the ultimate favorite around here! Thank you for this giveaway! My kiddo's LOVE extra hands-on activities! We love hands on activities in our house. This would be a tremendous blessing! Thanks for the giveaway opportunity! Sounds great! I love when other people share their plans! Oh, just saw the question. Yes! Hands-on activities are the best, but sometimes we don't have time. It's easy for me to let that slip, but it's definitely a favorite. If it's planned for me, that helps! My kids love hands on activities but I am so bad about planning them! :) These plans would be wonderful!! Thank you for the giveaway! Yes, but I'm horrible about coming up with them. I'd love to have some plans to help me out!! Kids love hands on activities. Mamma loves them, too, but they are tough to juggle!!! Would love these resources to make all our lives easier!! My kids love hands on activities... and I have used Solagratia's lesson plan for this semester... would love to use it again next semester! She offers excellent ideas and help! Im new to cc this year and havent done any hands on things with them. Id be super excited to get some ideas! Thank you for sharing and for the giveaway opportunity. We enjoy any CC helps that we can get! I am so non crafty and I get overwhelmed trying to find supplimental videos and games...I'd love to follow her advice and plans. Cathy, please email me your mailing address by tomorrow to get your Mega Verses CD from Giveaway #1. Thanks!